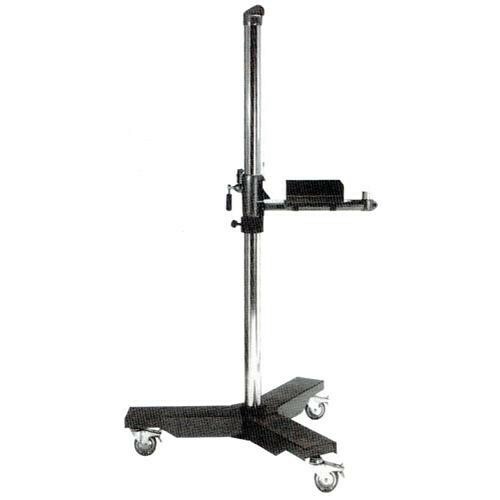 Arkay's 12 ft Mono-Stand 360 features a three-point base with ball bearing casters that lock rotation and swiveling with a foot pedal. A ball thrust bearing under the pulley cap allows the lateral arm to rotate a full 360° around the center column. The Mono-Stand 360's lateral arm is 22" (55.9 cm) long. Swift and smooth height adjustment of all cameras. Order a support post and geared camera head separately. Box Dimensions (LxWxH) 140.0 x 47.0 x 12.0"
12MS-360 Mono Stand 360 is rated 4.0 out of 5 by 1. Rated 4 out of 5 by Chris from Great Studio Stand! I've used $15,000 Stands all the way down to a tripod in the studio before, but this is a very nice Happy Medium. It rolls very well and the arm is easy enough to move and lock back. (The arm does take some minor adjustments with the tracking wheels to ensure that it tracks straight up and down without rubbing.) The arm is on the short side if you have to do Laydown/Straight down shots, but for normal straight forward shots you won't have any issues.